The comfrey is springing up now, so I should have a cut to go under some potatoes. I've taken some root cuttings and hope to double the number of plants this year. To the right in the foreground, onions garlic and shallots planted last year. All seem to be doing rather well. My friend Wali Hawes who was an incredibly talented potter was living in Japan and posted me some seeds. He passed away in 2014 just short of 62. Daikon is a variety of radish also known as Japanese radish, Chinese radish and Satsuma radish. They are white with a milder flavor than the small red radish, and can grow up to 3 feet long and weigh up to 100 pounds, although they are usually harvested at 1 to 5 pounds. Daikon can be eaten raw in salad, pickled, or in stir fries, soups and stews. They have a pleasant, sweet and zesty flavor with a mild bite. Edible Burdock is called Gobo in Japanese. Plants are cultivated mainly for the slender roots, that can grow to 4 feet long and 1 inch across. Burdock root is very crispy and has a sweet, mild pungent flavor, which is used as a delicacy in Japanese food. Burdock is a hardy biennial plant, but grow as an annual. 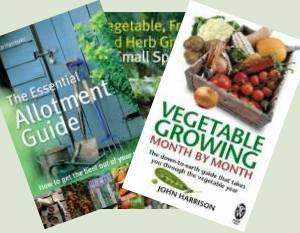 Seed are sown in spring for havest in late summer or in autumn for harvest in the next spring. I think it is a sort of mint come salad leaf - will report on it if it grows. Apparently it is eaten with sashimi in Japan. In the foreground is the onion bed. To the left are the seedlings in modules for planting and on the right set grown onions, shallots and to the far right, garlic. At the rear, the radishes are showing and you may make out the spring onions, which are just beginning to show. On the right, under the cloche, little gem lettuces planted in modules. Comfrey leaves laid in the bottom of the trench, covered with a little soil, then the seed potatoes are placed on top before being covered with about 4" or 5" of soil. The comfrey provides nutrients for the seed potatoes to get them off to a good start.